With Steppenwolf of the New Gods now confirmed to be the film's main villain, it likely goes without saying that the influence of comics legend Jack Kirby will be felt on Zack Snyder's forthcoming Justice League film. The film will feature both Old Gods (presumably Zeus and Poseidon, who have close ties to the mythologies of Wonder Woman and Aquaman, respectively) and New Gods, Jack Kirby's iconic 1970s creations. There are both good and evil members of what Kirby called the "Fourth World," but the most notorious is Darkseid -- whose uncle, Steppenwolf, is going to be the film's primary antagonist. "[Jack] Kirby is crazy and a great guy, and there's a lot of influence, you know?" Snyder told reporters at a set visit last week. "Sort of 'New God-y', New God stuff and we were digging on that. That's the mother boxes and that Apokoliptian world and all that stuff. You can't really do that stuff without some...I don't know if I'd call it weird. Larger than life. There, yes, thank you. The kind of scope-y, sci fi, cool but I think it's fun stuff." 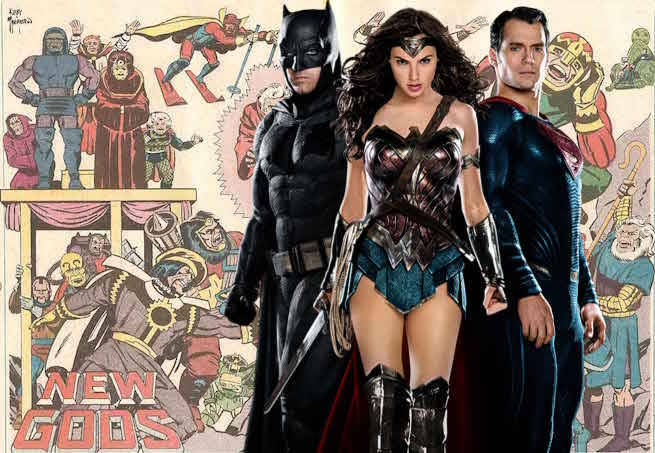 Besides the cool visuals and science-fiction feel that worked for many viewers in the opening moments of Man of Steel, Snyder said that there was a more practical reason to bring Kirby's Fourth World characters into the Justice League film. Steppenwolf is "also a bad guy that would justify the Justice League," Snyder said. "You know you have to have a good threat that is fun and kind of crazy. The Mother Boxes are always fun, DC weird tech." In Geoff Johns's 2011 reboot of Justice League, the team's first major story dealt with battling off Darkseid and the hordes of Apokolips. In the context of that story, it was during that battle Vic Stone was injured, and a Mother Box used to replace pieces of him and save his life. Ultimately, that Mother Box was key to sending Darkseid and his Parademons back to Apokolips. In the movies, of course, Cyborg has already been fused with the Mother Box, as seen in Batman v Superman: Dawn of Justice. Justice League, directed by Zack Snyder, is filming now. It also stars Henry Cavill as Superman, Ben Affleck as Batman, Gal Gadot as Wonder Woman, Jason Momoa as Aquaman, Ray Fisher as Cyborg, and Ezra Miller as The Flash. Spider-Man villain Willem Dafoe has joined the cast as Atlantean soldier Vulco, while Amber Heard will appear as Mera. J.K. Simmons has joined as Gotham City Police Commissioner James Gordon, while Amy Adams is expected to reprise her role as Lois Lane. The movie is set to hit theaters on November 17, 2017 -- the twenth-fifth anniversary of the release of Superman #75, the best-selling finale to "Doomsday! : The Death of Superman."